Jane Bell is torn. Gabriel Locke is back and has made his intentions clear. But Jane is reluctant to give up her inn and destine another man to a childless marriage. 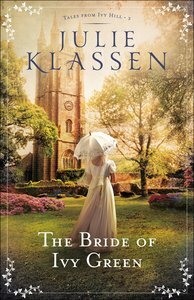 Then someone she never expected to see again returns to Ivy Hill... .
About "The Bride of Ivy Green (#03 in Tales From Ivy Hill Series)"
Klassen is a fiction editor with a background in advertising. Lady of Milkweed Manor is her first novel. Julie and her husband have two sons and liye in Minnesota. Customer Reviews For "The Bride of Ivy Green (#03 in Tales From Ivy Hill Series)"
Much has happened in idyllic Ivy Hill in recent months. Jane Bell is reluctant to give up her inn even though marriage is offered. Mercy Grove, resigned to spinsterhood, faces a momentous choice to become a governess. Meanwhile, a secretive dressmaker turns up - imposter, or fugitive? A sudden change in circumstances sees genteel lady Jane Bell inherit The Bell inn - and its considerable liabilities. Tempted to return to her former life of ease, Jane soon realises there is more at stake than her comfort. Can Jane turn the place around and keep the bank at bay?